The Scott Lumber Company on the west side of Burney was well established by the time the McCloud River Railroad reached town in July 1955. Scott was an old customer of the railroad already, as they had trucked their products to a reload at Pondosa for many years. The mill had to have it’s own rail service, but the mill was on the opposite side of town from the railhead. The solution was the seven mile long Scott Lumber Company branch that started out from Berry and looped around north of the town of Burney to the sawmill. Scott Lumber Company sold out to Publishers Forest Products who continued to operate the mill until 1978, when they shut down. The mill was purchased by Sierra Pacific Industries shortly afterwards, and the branch was re-named the Sierra Branch to reflect the new ownership of the sawmill. Sierra Pacific re-opened the sawmill in the early 1980’s, and it has been the primary reason for the continued existence of the railroad since. 11/2002. 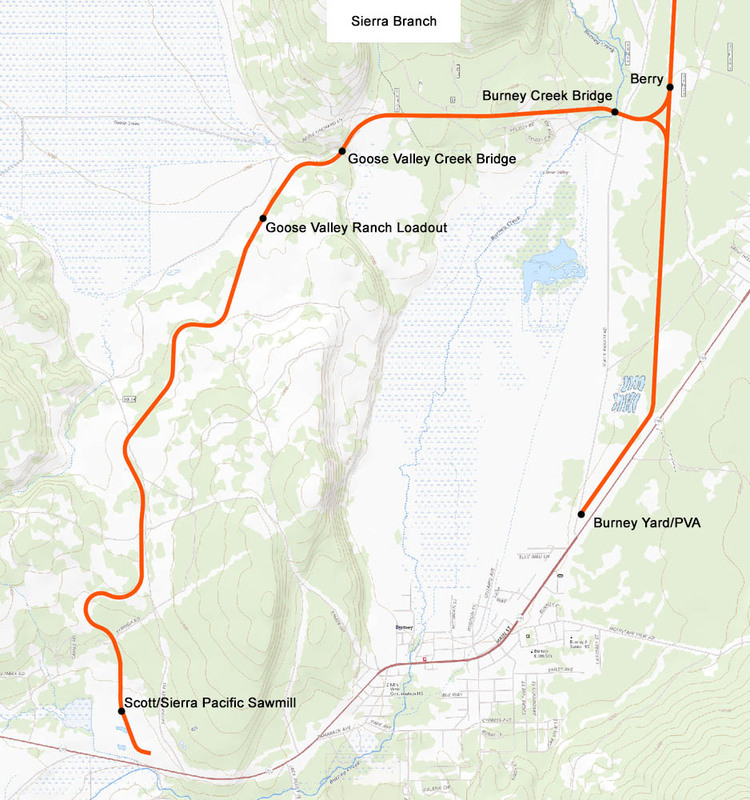 Immediately after leaving Berry, the Sierra Branch crosses Black Ranch Road and Burney Creek. 5/2003. Locomotives #38 and #37 are taking three empty centerbeams to the Sierra Pacific sawmill. 5/2003. Several miles of the end of the branch were burned over in the Fountain Fire of August 1992. A new forest is growing on the fire scar in this view taken eleven years later. 5/2003. Locomotives #37 and #38 have just crossed Goose Valley Road about milepost S-6 on the Sierra Branch. Circa 1994. The Sierra Pacific Industries Burney sawmill is located at milepost S-7 at the end of the Sierra Branch. This is an overview of the sawmill. 5/2003. The railroad enters the rear of the sawmill on a steep grade. The Sierra branch bisects the sawmill complex, and two passing sidings (one for loading woodchips, one for loading lumber) branch off of the line. 5/2003. The chip loader is seen here on the right; the lumber loading track is to the left. Chip hoppers are gravity-fed under the chip loader, then rolled onto the tail track at the bottom of the mill complex.